Capital District Clean Communities was first designated by the U.S. Department of Energy in 1999. Coalition membership has grown to over 100 members from both the public and private sector. The Coalition has met quarterly for 17 years. As fuels, technology and stakeholder needs change, so must we. 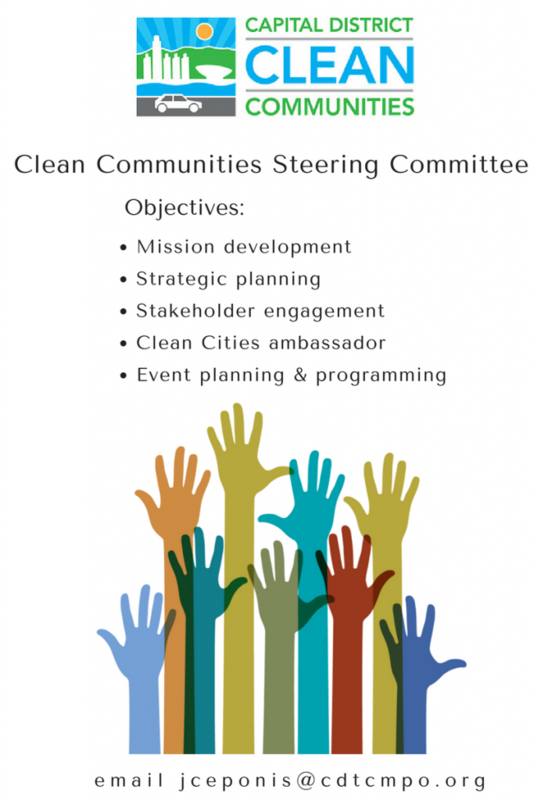 Clean Communities is looking for volunteers to serve on it’s first Steering Committee. The Committee’s first task will be providing input on the 2017 Annual Operating Plan. Steering Committee members will be expected to guide strategic planning, keep the coalition on mission, assist in the planning of events and programs, and serve as Coordinator proxy when needed. If you are interested please email jceponis@cdtcmpo.org.